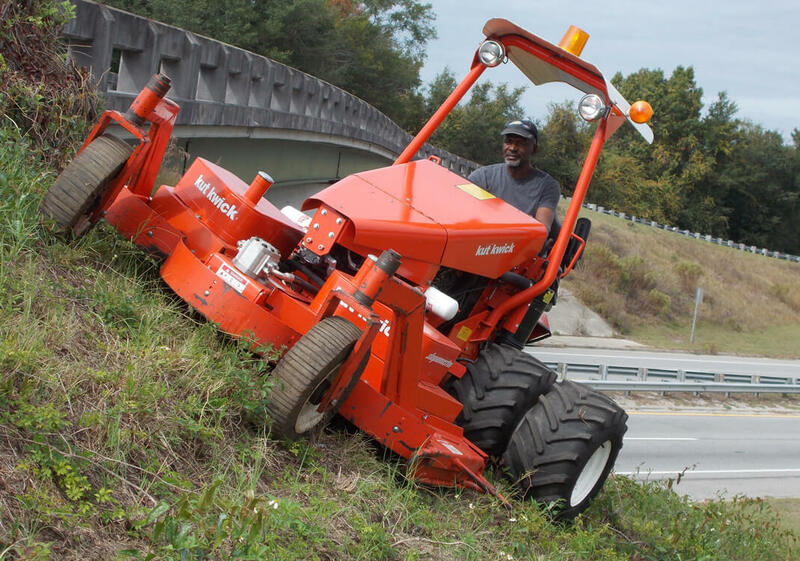 The SuperSlopeMaster™ is in a class all its own when it comes to extra heavy-duty commercial steep slope mowing, mowing slopes up to 40°. 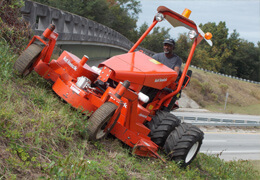 The #1 commercial land clearing steep slope mower on the market. 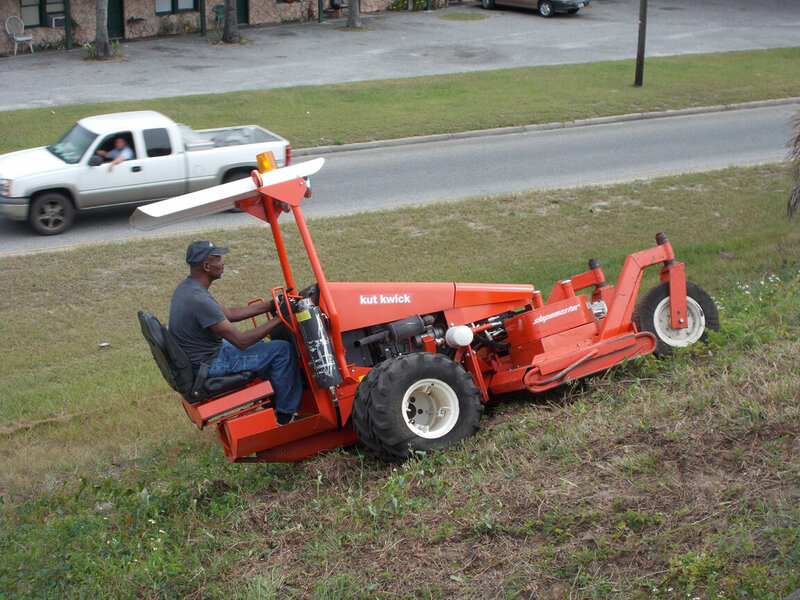 The SuperSlopeMaster™ is designed to cut rough terrain, including heavy grass, weeds, and occasional low brush. It has a powerful 36 HP Yanmar diesel engine and 1/4" steel deck, with three 3/8" cutting blades. 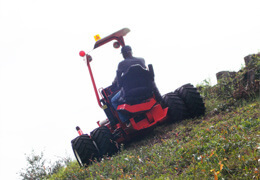 And the SuperSlopeMaster's skid steering mechanism, through its twin, closed loop hydraulic systems, offers the great maneuverability and power that is required to mow steep slopes. 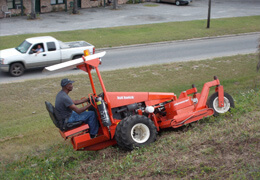 Machines with steering wheels are not as maneuverable and cannot operate safely on steep slopes. 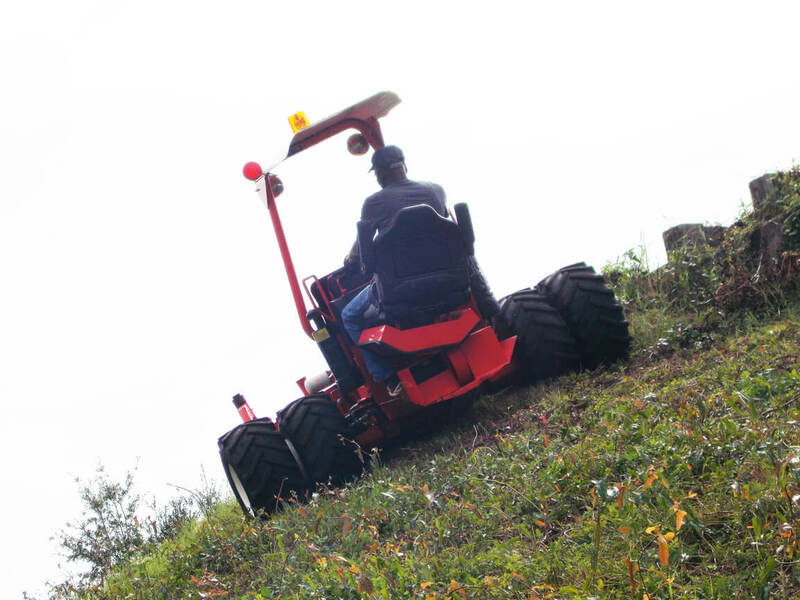 With the ability to cut at a 40° slope, this true "zero turn radius" machine can trim around objects and mow a swath of 72 inches wide without leaving the slope! 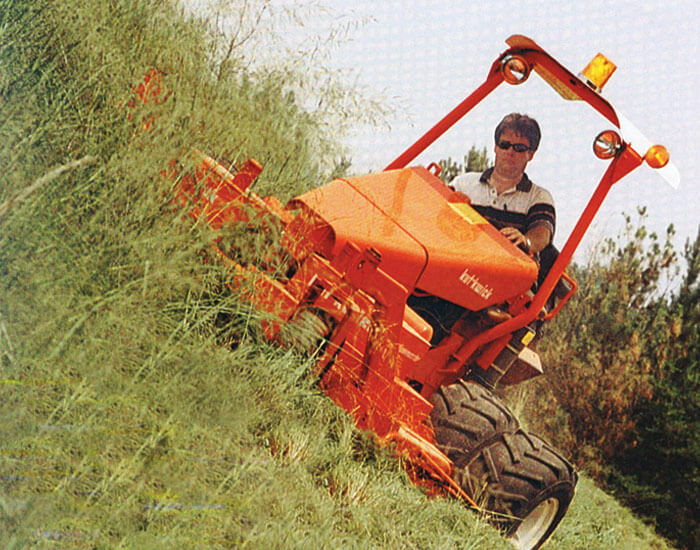 It will cut more area in a fraction of the time compared to other machines – and with maximum safety. For safety, if the operator inadvertently leaves the seat the mower is immediately braked. For safety, the operator sits on a tilting seat located at the rear extremity of the machine, positioned to safely exit the machine. 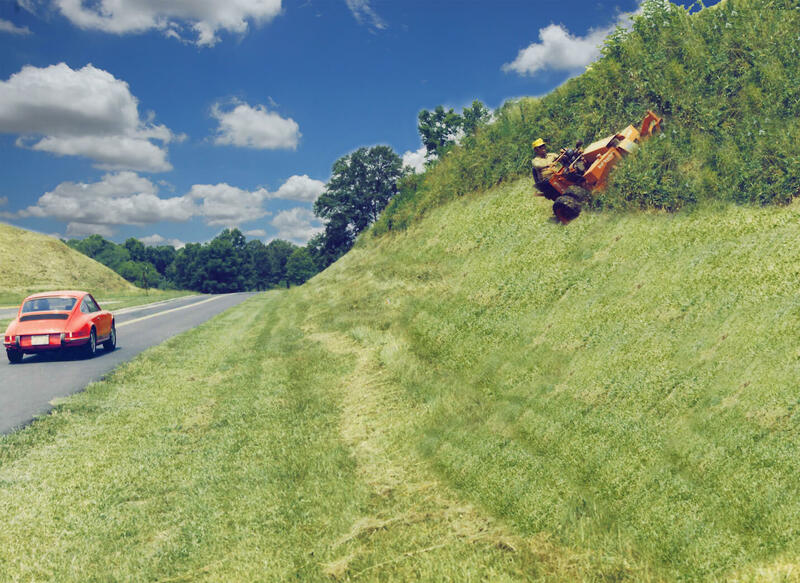 While mowing, the operator looks forward for safety. The deck supports the chassis from the front, while pivoting side to side to follow the contours of the turf. 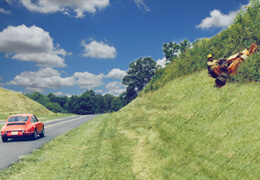 The SuperSlopeMaster™ offers maximum versatility as both a rough cut and a finish cut mower. 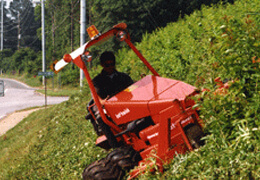 The standard flat blades are best for rough mowing. Flat blades allow the most powerful cut in heavy growth. 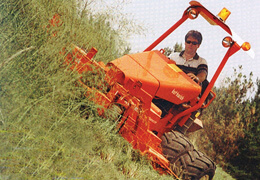 The machine can be quickly converted to the optional high lift blades for finish mowing. For finish mowing, the cutter deck is lowered close to the ground to give the best protection from thrown objects. The standard tractor tread tires can be replaced by the optional turf tread tires when the machine is to be used primarily for finish turf mowing.